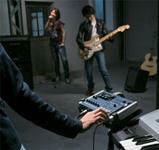 Backing tracks generally come in two flavours - Midi and Audio. Midi is a way of sending musical data between electronic devices; information about what notes to play, how long, how loud, and what instrument to use, etc. However midi does not send any sound at all and relies on the final link in the chain (usually a keyboard or "sound-module") to produce the actual music that's heard. Audio is simply a recording played back. This could be a recording of a midi performance, real instruments and voices, or a combination of both. Midi is flexible - it's possible to change to any key or arrangement of the song without affecting the sound quality. But the final sound depends on the device used. The same Midi-file that sounds weak on, say, a regular computer sound-card, will sound better when played using a dedicated "sound-module". Audio is much more reliable - an mp3, for example, will sound the same whether on a computer or a portable mp3-player. However the key/arrangement/ending is fixed. Experience has shown us to use the advantages of both - create tracks using midi and audio, but for the performance (where reliablity is everything) use audio. Let's assume you chosen audio and that you've gone "digital". We can supply tracks in the format of your choice (except DAT).